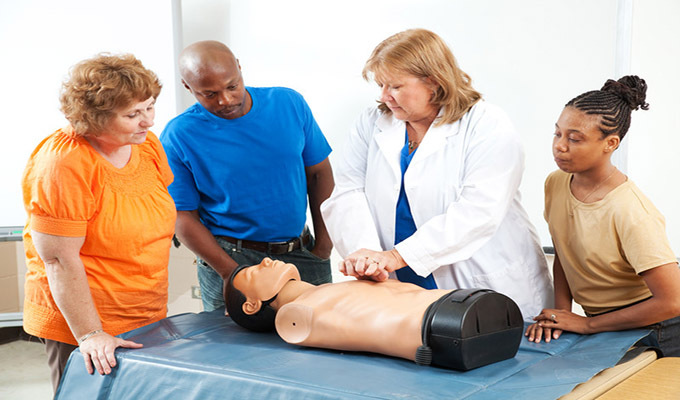 Learn to instruct the American Heart Association Heartsaver Courses (CPR/AED/FIRST AID). Candidates need to complete three steps: 1.Complete the Core Instructor Course. 2.Complete a discipline-specific instructor course in Basic Life Support (BLS) or Heartsaver. 3.Get monitored by an American Heart Association Training Center or Instructor. BCFMT does not affiliate every candidate we train. BCFMT does offer an affiliation program for business partners. Our next CPR Instructor Course will begin March 5, 2017. The course includes 1 documented observation of a CPR class in its entirety, completion of all pre-course assignments, and 2 full days of classroom sessions. March 19 & 26 Station 2 Walker Avenue Pikesville MD. Classroom entrance on rear lower side of the building. Classes on the 19 & 26 will start at 8am and run until 3pm. The cost is $450 for the Healthcare Provider Instructor Program, $600 for the Heartsaver Instructor Program, and $700 for the Combined Courses (best choice). The Heartsaver Instructor Program includes the Heartsaver CPR & First Aid courses. The difference in price reflects the difference in cost of the AHA required Instructor materials. The course fees include the Appropriate Instructor Guide(s) with DVD, and a pocket mask. You will be responsible for purchasing your own manikins, books, pocket masks, bag-valve masks, AED trainers, gloves, and decontamination supplies for use once the course is successfully completed. There is a lot of preparation necessary before the first classroom date. Prior to the first class, you must review the entire Instructor Video(s) and take notes on every section. While preparing your notes, identify any questions that you have or think students observing the video might raise. Throughout the program you must display your comprehensive knowledge of the program content as well as demonstrate skill proficiency. Payment for the course may be remitted via credit card or paypal on our website during the registration process. You must have payment remitted by February 24, 2017 to participate in this session. This will provide you ample time to complete all of the pre-course requirements. Plan to arrive at least 15 minutes early. No late arrivals will be allowed. All classes are mandatory and no make-up sessions are available. There will be NO REFUNDS once you receive the instructor materials. Finally, you are responsible for locating your own AHA Training Center for Affiliation and complying with their requirements. You may apply to BCFMT for affiliation, however there is no automatic acceptance. You MAY NOT TEACH without being affiliated with an AHA Training Center. To register for the combined BLS/HeartSaver Instructor Course, choose the Register Now button below.